Providing a step-by-step, hands-on approach, this incomparable guide offers useful and interesting information on food sanitation at all stages of food processing and stresses how important the role of each employee is at each stage. Essentials of Food Sanitation covers a wide variety of topics from cleaning and sanitizing compounds, systems and equipment to food sanitation in various types of food processing such as dairy products, seafood, meat and poultry. 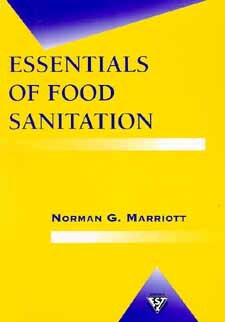 Each chapter provides food handlers and students with interesting real-life reports of recent food sanitation problems plus different techniques to ensure firm understanding of the subject, including: visual aides; a comprehensive glossary; several summaries, study questions; references; chapter bibliographies; a resource section on how to learn more about the topic; and case studies. A thorough discussion of HACCP and how a HACCP system relates to quality assurance and sanitation functions is also outlined. There is a final section on the book about foodservice, including the methods and principles for sanitary food handling and considerations at various control points in the flow of foodservice. What causes microbes to grow?